Vince Vaughn leads an all-star cast in the laugh-out-loud comedy about eight friends whose vacation in paradise is one they’ll never forget. Their group-rate vacation comes at a price when they discover that participation in the resort's unconventional couples therapy activities is anything but optional. 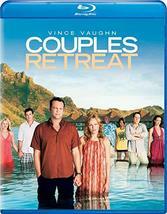 Co-starring Jason Bateman, Jon Favreau, Faizon Love, Kristin Davis, Kristen Bell and Malin Akerman, Couples Retreat is a hilarious party in paradise, loaded with laughter and fun!